The Greek Key is H-O-T in interiors! From fabrics to furnishings, I am definitely a huge fan of the classic design. 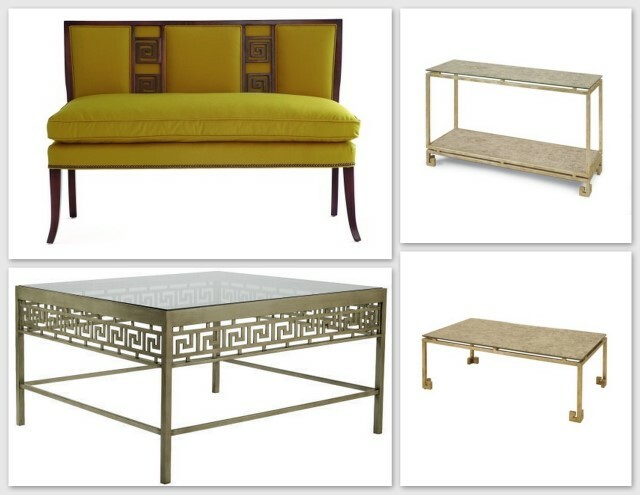 One of my favorite furniture pieces is the Cypress cocktail table by Mariette Himes Gomez for Hickory Chair (pictured left ~ bottom left of photo). Today, I’ve asked my uber-stylish friend Shelly Rosenberg to give us a little insight into some delicious designs featuring the chic motif. Designing is pure joy. I just love the limitless options that we have to choose from. Although many interior designers have a trademark look, I pride myself on collaborating with each unique client and creating their own style. However, there are some classic motifs that I find myself relying on time and again, regardless of replicating a historical genre or redesigning an abode into a super sleek mod pod. My favorite of all time is Greek Key, a meandering deign of lines, graphically and repetitively folding into it self. Despite its name, the ancient Greeks were not the only civilization to discover this geometrically based design. Similar patterns have been found in the region that is now Vietnam and also in the Native American Hopi culture. This versatile motif can also change shape. We are most familiar with the square or T configuration. But there are also “keys” that resemble waves on the sea and even triangles. Almost like a maze, this crisp design draws us in and guides our eye along the shape it traces. It looks so elegant on the leading edge of draperies, like I have in my own master bedroom. The charcoal and ivory trim add a masculine balance to an otherwise feminine boudoir. It also looks regal along the bottom of a silk lampshade. You can affix your own Roman border to a simple, store-bought shade, adding a smart sophistication. There are so many fabulous options through your interior designer. Another option I use in a pinch is M&J Trimmings of New York. Other designers before me have inspired my own work with Greek Key. Local trend-setter, Jan Showers, mimics the lines of fantastic antique chairs by sewing black ribbon onto the ivory linen upholstery in a key style. 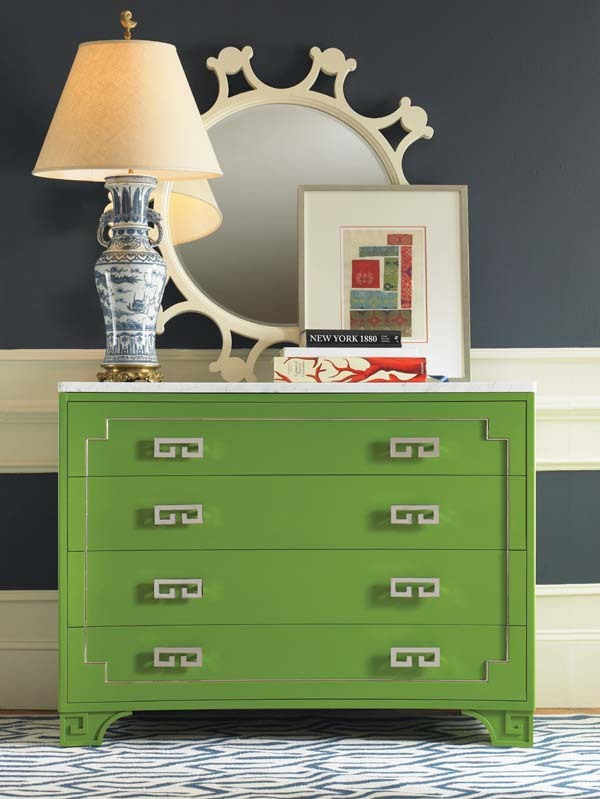 Fashion icon Oscar de la Renta adorns his delicious cased goods with Greek Key hardware in his collection for Century Furniture (available at IBB Design Fine Furnishings). The one pictured left, in apple green is divine! Thank you so much Shelly for sharing some fabulous design inspirations with us featuring the Greek Key!